This post is a little more personal, but will hopefully bring back good memories for some of you! I was the first of my friends to try a work-abroad program and the first to visit Japan, despite the shared interest that had carried most of us through the university Introduction to Japanese program in its very first year. Living in the Atlantic provinces makes travel expensive in general, and going abroad particularly so, thanks to the lack of a truly international airport. Because of this, it was very, very rare to see anyone from my province applying for the JET programme, and I know the names of most of us who've done JET in the last decade. When I applied, I paid my own way to Toronto to take the interview, and then had to return there for my eventual departure. It's not an inexpensive venture, and I forfeited lots of great experiences like the pre-departure orientation and reception by being out of province. I knew this was the chance of a lifetime, though, and I went for it. So when I finally set down in Osaka, it was with an open invitation to everyone I knew - "come visit me in Japan!" The first familiar faces I saw were Mel and Laura. Laura was studying at Ritsumeikan and Mel was actually in town visiting her, but she spent a night or two with me...and we of course spent another night or two at Spa World. 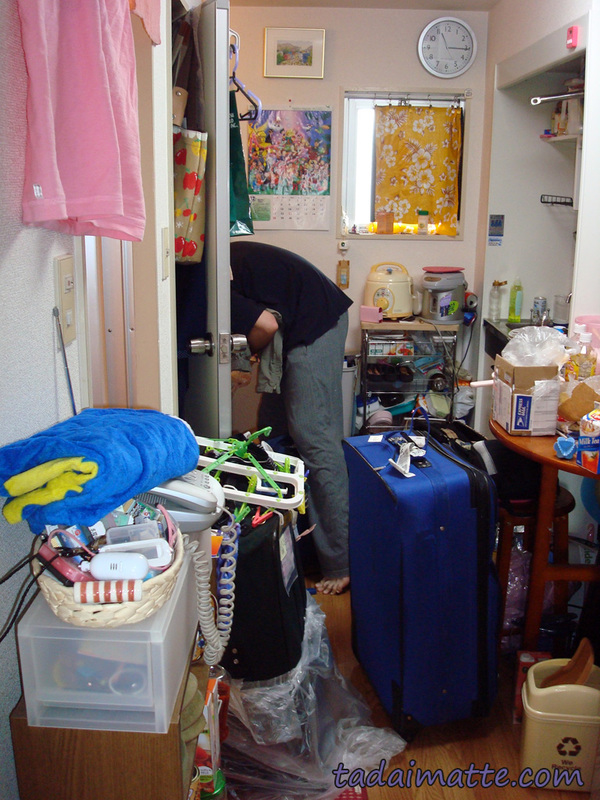 They had the good fortune to see my apartment in its original state, before I started collecting a hundred million little knick-knacks that, by the time I left, filled a dozen 30kg boxes. My next set of visitors, and the first group I'd truly host, were Zippo, Anne and Shaun. I wasn't shocked that Zippo was first in line when he heard I was off to Japan, but it was really a treat to have the other two, as it was rare we got to meet outside of our annual get-together in Baltimore. It was cramped in my little apartment, to the point where I had to move the kotatsu out onto the balcony when it was time to sleep, but we made do. The four of us went all-out as I engineered my first solo (aka without Emily to guide me!) trip to Tokyo, had my first visits to Disney and Universal Studios theme parks, saw the Shibuya scramble crossing and Hikarigaoka Park, and fell in love with Odaiba. 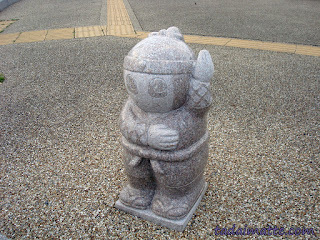 We toured the temples of Kyoto and stayed in a capsule hotel, visited the Tezuka Museum in Takarazuka, and so much more. I'd discovered a real penchant for planning trips, which is how I eventually came around to writing for a travel blog. Drew, another multi-visitor, arrived in May and we had a wacky adventure in Iga-Ueno, the ninja town in Mie prefecture. We undertook some serious transportation risks bussing home that night! I also took him to my favourite hair salon to have his long, curly hair professionally straightened. The stylist was absolutely bananas and, every time I visited him over the next few years, he asked about Drew. That spring, I had my first visit from Gwen and Alec, friends who I would later sacrifice (on their honeymoon, no less) to the hungry Mount Fuji. They were stopping by en route to or from Indonesia (I forget which), and made their way to my place to eat Pizza-La and okonomiyaki. Later in summer, I hosted Marisa, who got a whole article to herself sometime back. While she was here, I went to my first Japanese festival, Tanabata, which turned out to be my favourite holiday by the time I left. All this in my first year! When I returned to Osaka after a family reunion back in Canada, I arrived with my cousin Cassie in tow. The two of us flew in together and took the opportunity to travel on the Moonlight Nagara, an experience I hope never to have to repeat. I completely ruined her on hot springs (I was a fan, she was not), we toured Shibuya extensively looking for locations from a Nintendo DS game, and we rode the shinkansen back, which is always fun. Cassie still frequently regales people with my ability to pack away food after she would be unable to eat the rest of her lunch or dinner, and I would attack it in true mottainai spirit. By the time Cassie left, my apartment was growing less and less able to comfortably host more than a single guest, so it was lucky enough that I had the fall and most of winter all to myself. Still, that made it a little more cramped when Erin arrived in February to carry out a trip she'd intended to take nearly a year before. A Religious Studies major, I saw more temples with Erin than I had with anyone else, and visited Nara on the fantastic Kintetsu trains. Of course, I sound like a real jet-setter here, always having company over - the key point was that while everyone else slept and toured and went to the places I'd already been, I went to work. Aside from the first group of Zippo, Anne and Shaun, I don't think I ever had a single visitor come who I could afford to take a lot of vacation time for. There were just too many! Luckily, since so many people came in groups or were comfortable getting around Osaka on their own, they could do their own thing too, which was fantastic. That summer I went to Los Angeles to stand in Gwen and Alec's wedding, and returned with them in tow, along with Drew. 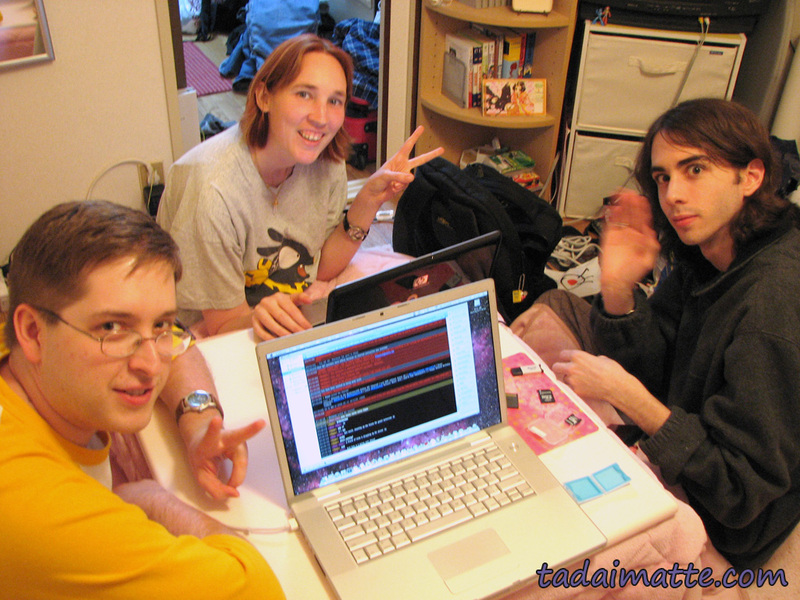 We stayed the week in Tokyo, attempted a climb of Mount Fuji, enjoyed the most luxurious ryokan I will ever set eyes on, then returned to Osaka to cram, briefly, five people into my apartment. By this point, there wasn't room on the balcony for the kotatsu anymore, so I slept under it while the others took the futons. Drew went home the day of our success with Fuji Mark II, but Jenna was left in his place. With this group, I went to Shirahama and tried my first mixed onsen. Shirahama was an unforgettable experience that I'll definitely write about in detail soon! Almost as soon as Jenna was on the plane back to Canada, Ami-chan arrived, and with her I managed to do quite a few things I never made time for until that point, including doing a few anime/manga pilgrimages. We went to Conan Town, hometown of Detective Conan author Aoyama Gosho, rode the pirate boat around Tempozan, and, after a brief stop in Tokyo, saw the gigantic Gundam statue that stood at the time in Shiokaze Park. A mess-up happened with her flight, and so Ami and I spent the last day wandering through Azabu-Juuban, the setting for our childhood favourite Sailor Moon. I still remember us learning all the lyrics to the dub songs in junior high, so that we could sing along to the MIDI music we downloaded onto her father's computer. The 56k days! Azabu-Juuban had changed a lot, but some of the places were still there, and I know I was so happy we got to see them. Over the winter, the visitor trickle slowed, but in April, Gen came to visit and she had a whole new set of things she wanted to see in Kyoto, so we went to Arashiyama and Oukouchi Sansou. We saw the Osaka pro basketball team, the Evessa, play a game. We took a night bus to Tokyo and spent my birthday in Odaiba, and the rest of the week touring other favourites like Harajuku and Shinjuku. After spending too much time in the 8-Bit Cafe, we missed the bus back (during Golden Week! Argh!) and, with the buses booked solid, stayed overnight in a Net cafe before swallowing our pride and taking the shinkansen home. Back in Kansai, we went to Nijo, which I should have done years before. Gen's visit was followed up immediately by Mana, one of my Japanese friends. She wanted to visit Osaka for the weekend, and had kindly had me stay over at her place in Gunma prefecture that winter, so I readily agreed. As it happened, Marisa wanted to return for a second visit, so I actually had them both stay at the same time so that we could hang out together. It was very rare for me to be showing Japanese friends around Kansai rather than me going to Kanto to meet them, so we had a great time just doing the regular Osaka things like the Dotonbori and Umeda and Banpaku-koen, eating okonomiyaki, etc. 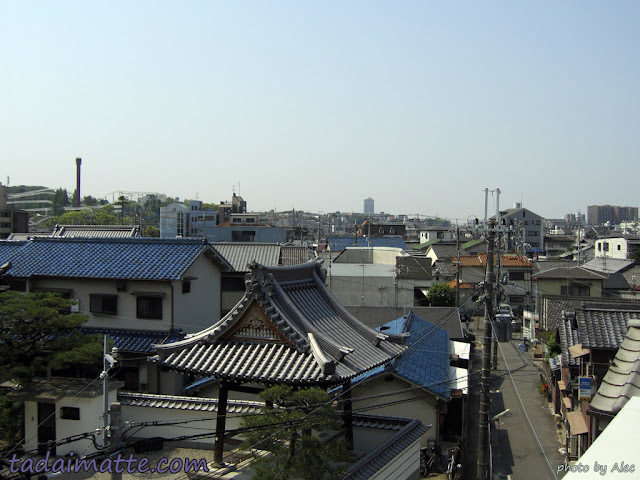 By this point, of course, my time in Japan was drawing very short, and I was spending a lot of time out of the house, travelling to Mie, Himeji, Rokko and other places on my bucket list. 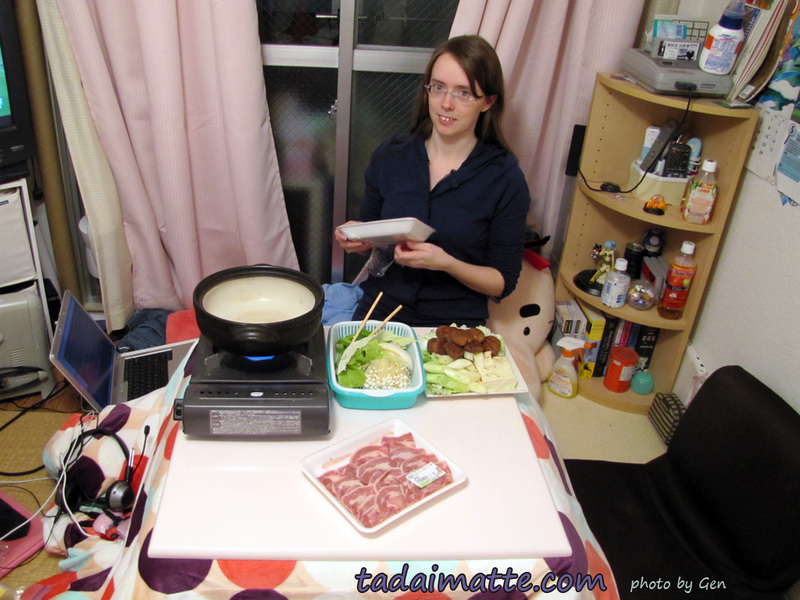 Mel came to stay during this period while she got set up for her own working holiday in Japan. She was with me about two weeks, but we didn't actually have many opportunities to spend time together, with her job-searching and touring and me trying to pack up my life and set things straight for the next NET - I would not be being replaced; no JET would come after me. It was not, I think, a wise decision by Osaka, but it was out of my hands. Mana came to stay for a night one last time in July, and then, once Mel had left, I gave away my second futon and prepared to go home. 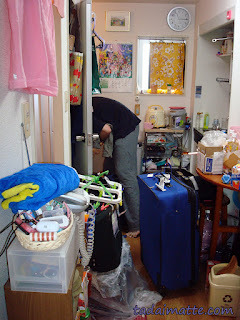 Mitsu was the last person to crash in my apartment as he helped me pack everything up in the final days. When I think about how many people stayed, even for just a night or two, I'm completely bowled over. Some of them I hosted for as long as three weeks! Sixteen people - some of them multiple times - took the time to visit my little 1K and share a few memories. I won't forget what a fantastic experience sharing my tatami with all of you was.